Limited Lifetime Warranty on our Wood Products! Our product will last you a lifetime. We have clients around the world that have been using our shelving for over a half century. Most of the shelves produced in the 1960's will still work in today's Lundia product. However, we cannot offer any guarantee that our current shelves, uprights and parts will absolutely fit in older existing components. The simple reason is that our product has been in existence for over a half century. We've seen numerous knock off versions of Lundia that don't match. Lundia manufactured in Europe is not interchangeable with Lundia made in America. We've also moved our U.S. production facility and new machine settings can effect tolerances on newer material that might not match a Lundia unit from the 1960's or 70's. If you are looking to add on to your older Lundia system, we recommend buying a single shelf or part to first test the fit before ordering all your parts. Our Lundia Solid Wood Shelves and Uprights come with a limited lifetime warranty. Our Lundia Wood Drawers come with a limited 5 year warranty. This warranty is valid on all Lundia orders with The Recom Group, Inc. after January 1, 2008. Proof of purchase is required. The Recom Group (TRG) warrants to our original customer that our products are free from structural defects in material and workmanship. Subject to the conditions and limitations set forth below, TRG will, at its discretion, either repair or replace any part of its products that prove defective by reason of improper workmanship or materials. Repaired parts or replacement products will be provided by TRG on an exchange basis, and will be either new or refurbished to be functionally equivalent to new. If TRG is unable to repair or replace the product, it will refund the purchase value of the product. Customer is responsible for freight/shipping costs to and from TRG. This warranty only covers parts that are rendered unusable due to manufacturers defect. Cosmetic or aesthetic imperfections are not covered as wood is a natural product that can and will change over time. This warranty does not cover wood splinters, slight cracks, chips, dents or scratches that have no impact on the structural usability of the product. Because this is real wood, you will have natural coloration variances with different shelves and uprights. Knots are inherent and characteristic of this type of product. All knots will be sanded smooth. You should expect that you will have knots in your shelves and on your drawer fronts, which is typical of solid wood. Any warping or bending of wood is not covered under this warranty as unfinished wood used in high moisture environments may deflect or warp. We recommend adding a finish to prevent this if your home is in an area with high temperature variations. A warped shelf will most commonly occur when it is NOT being used. Rarely will a shelf ever have any warping when it is used in a shelving configuration with books or other product loaded onto it. This limited warranty does not cover any damage to this product that results from improper installation, accident, misuse, natural disaster, overloading, or modifications of any kind. Any modification (Including cutting, drilling or screwing into the wood) will void warranty. Customer must have the original sales order, invoice or proof of purchase showing purchase date on or after June 1, 2009. Our High Density Storage Systems are built to the highest quality industry standards. They have been designed to eliminate all potential wear or stress problems over long term extended use. Every High Density Storage System purchased from Lundia/Recom Group is under warranty against any manufacturer’s defects in materials or workmanship for 10 years from the date of installation. This includes all of our High Density Office, Stockroom and Golf Bag Storage Systems. If any part fails, we will replace it at no cost to you. This includes on site labor and any travel costs for our installer to repair or service your system (Only if we did the original installation). On systems installed by others, any defective parts are still covered for 10 years. (Our warranty does not cover repairs or parts due to abuse or damage by the user). Any warranty service will be done by factory trained authorized installer(s). 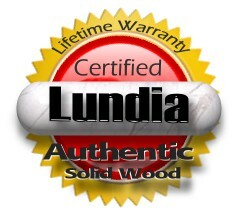 In the event warranty service is needed, simply call us toll free at (888) 989-1370.
with Authentic Lundia USA........ since 1957!